We celebrated my “big boy’s” third birthday this week! He’s completely obsessed with trains, so I decided to make him a train cake. Last year I made him a car cake, but this year’s definitely had to be a train. So, this cake turned out kind of big… I had to cut out a piece of cardboard from a box and cover it with foil because I don’t have any plates big enough to hold this cake. I used two cake mixes to make it, and two cans of frosting. If you’re making the cake/frosting from scratch, you’ll want to double the recipes. 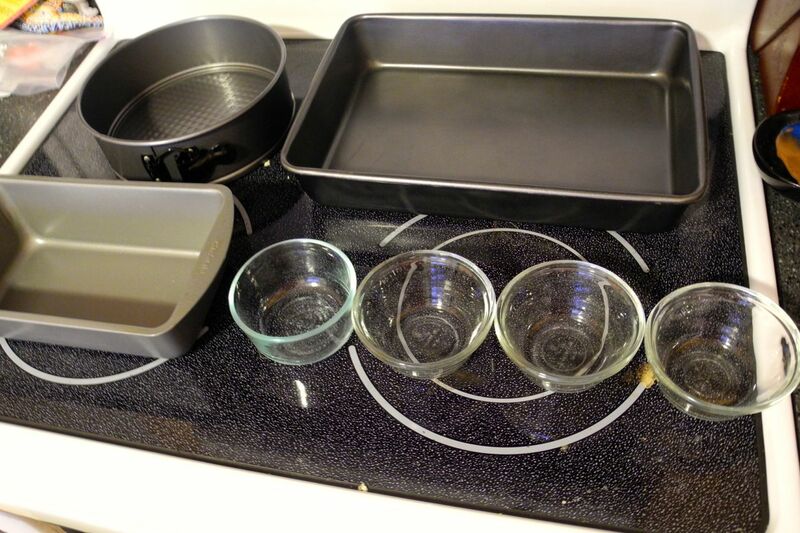 Here’s all the different pans I used to make the train cake. I know, I’m a little crazy. But it actually wasn’t that difficult, just a little time-consuming. 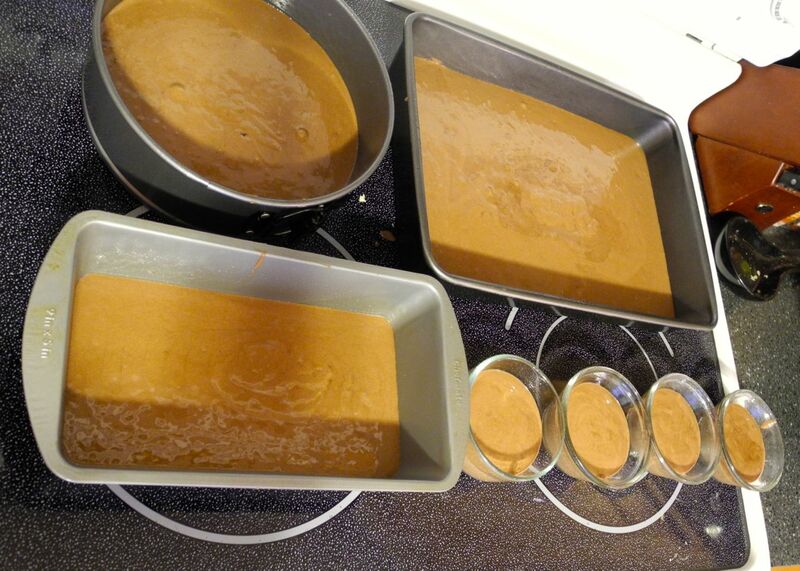 So once you’ve got your cake batter ready and oven preheated, evenly distribute the batter between all the pans. You’ll want them to all be about the same height (the wheels can be a little higher) so that when you put all the pieces together they’re pretty even. Each pan was probably only about 1/2 full, and the ramekins were about 3/4 full. Since I had so many different sizes, and they weren’t quite as full as normal, I checked them fairly often for doneness. The little ones were done in about 15 minutes, everything else in about 30 I think. Let them cool a bit, then turn out onto cooling racks to finish cooling. Be especially careful with the sheet cake when removing it from the pan – mine cracked! It turned out ok once I frosted it, especially since I had to smooth the edges between the different pieces anyway. The 9×13 sheet cake makes up the main body of the locomotive. Cut the 9″ round in half, and put one half on the end of sheet cake to make the front of the locomotive. Cut about 1/3 of the cake from the loaf pan off, and use the remaining 2/3 to make the cab. Cut a small piece from what’s left to make the funnel. Cut a small piece from the round edge of the remaining round cake for the roof of the cab. Set each of the wheels over the cake where you want them, and cut around them to make a slot to insert the wheels. Now mix up the colors you want for the frosting. I used one whole can of frosting to frost the main portion of the cake (the blue). Then I mixed about half of the other can in green for the wheels and other accents. I left the rest white for trim, etc. My trick for frosting this cake without it crumbling to bits? I melted the frosting. I stuck it in the microwave for about 30 seconds until it was nice and runny. Then I let it cool for a few minutes, and then basically just poured it on the cake, and used a knife to smooth it out. I took the green pieces off first so the blue wouldn’t run onto them, and frosted those on a separate plate. Then I put everything back to together, added the white trim, and ta-da! We had a locomotive cake!! Love this bright, energetic, crazy, fun little birthday boy! 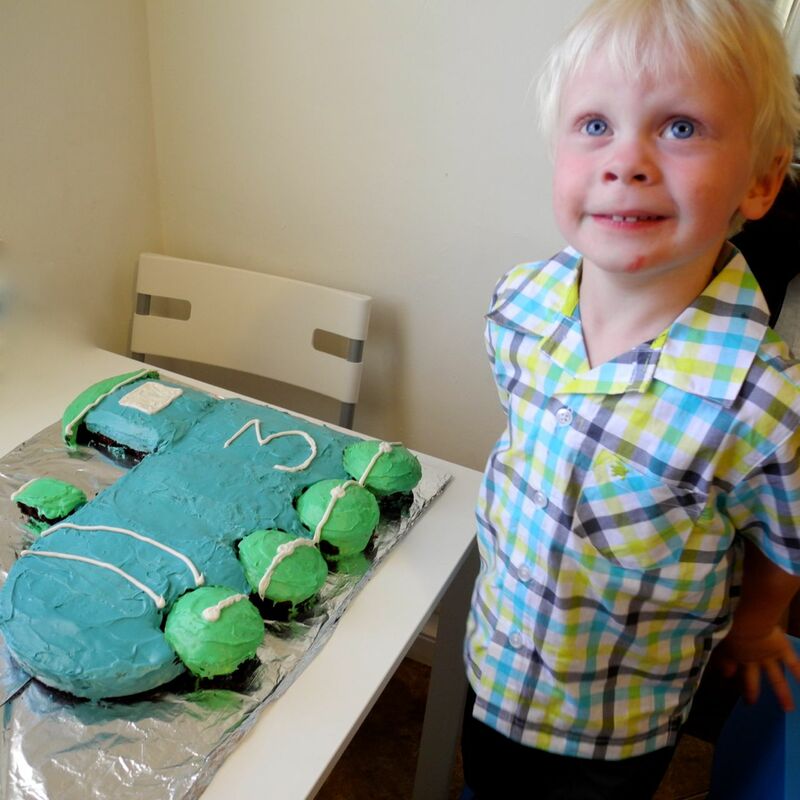 And he loved his train cake!! 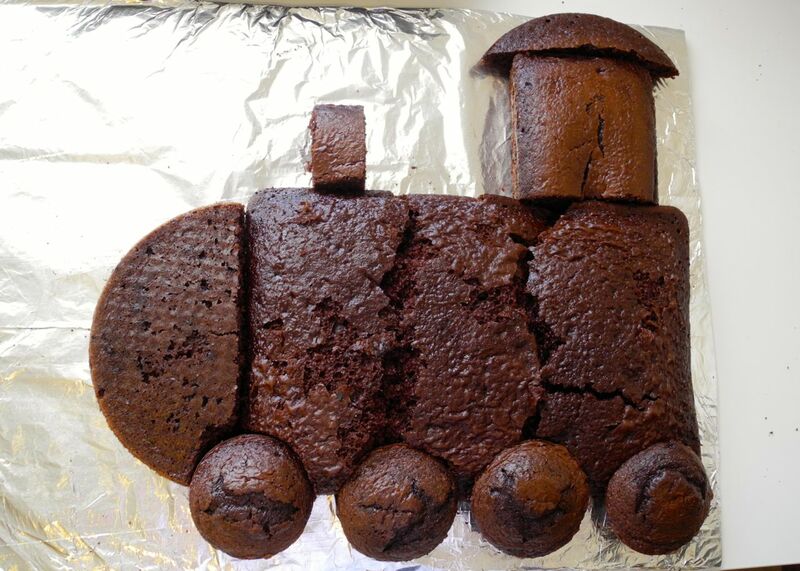 My son will be 3 this coming Sunday (4/3/2016) and is super excited to have a train cake! Last year he had a tractor cake but this year he is requesting a train cake. I need a cute easy cake and this one is perfect!